"O my friends there are no friends" by Sigalit Landau, is today's sculpture in the city. 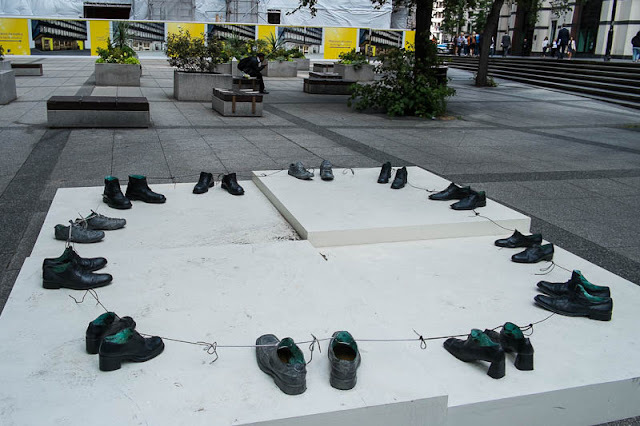 The artist states the piece is "a commemoration of the future, when we will be able to slip into these shoes and be part of a community that will create a better history, with more solidarity, more generosity and regeneration". I've always thought it strange that even with the invention of slip-on shoes and Velcro fastenings so many of us still cling to something as inconvenient as shoe laces. Apparently the future is equally keen on such fiddly things. It's a hopeful message but, I'm not sure the shoes necessarily represent that. I think that concept flew right over my head.